We all know how quickly technology evolves. Apple’s iMac desktop computer has been no exception, since its early days as a colorful, translucent machine to now a thin, aluminum design with vastly improved processing speeds. 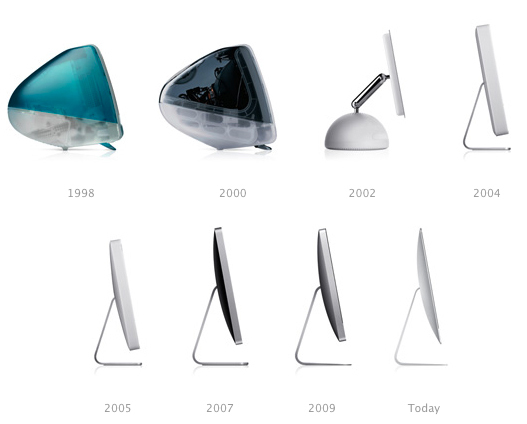 Today, the iMac celebrates the 20th anniversary of its launch. Designed by Apple design chief Jony Ive, the iMac G3 was unique among computers at the time for its unusual shape, the use of translucent plastics that allowed the internals to be visible, and the bright colors that Apple adopted. Apple's first iMac, which sold for $1,299 at launch, came equipped with a 233 - 700MHz PowerPC 750 G3 processor, 128GB of storage, a 15-inch CRT, a CD-ROM drive, and an ATI graphics card, components that don't sound impressive today but made for a powerful, well-rounded machine, that, in combination with the design, made the iMac a best seller. Fast forwarding ahead, the iMac of today is now available in 21.5 and 27-inch size options, coming in 4K and 5K Retina displays, respectively. Kaby Lake chips, AMD graphics, and SSDs are also now part of most machines. There’s also now an iMac Pro, that’s geared for Apple's professional users with a unique Space Gray body, Xeon processors with up to 18 cores, Radeon Pro Vega graphics, and up to 4TB of SSD storage. Clover notes that while it's expected Apple will probably refresh the iMac lineup yet in 2018, possibly within the next couple months, it's hard telling when the next potential design change might come. It is expected that whatever next iteration should have improvements though that should make a great desktop even better.